2007 began with one-of-a-kind projects. Year of the Box! Please inquire for price. For editioned work, please see the T-ravel subscription. More unique books by year. 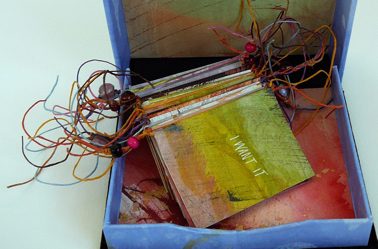 With its variety of painted and paste papers, this little book with the tied binding and beads will make you want it. Contained in a clamshell box, covered in black velvet, I Want it is a little gem waiting to make you laugh. What are those red and white buildings on the airport runway? Does G-d talk? Who is listening? This tiny little book with its own antenna contains thought balloons of a conversation between five people who meet while trying to catch a plane. 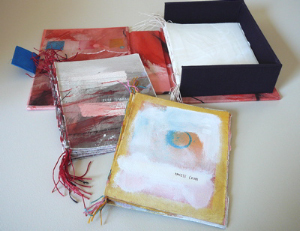 Painted paper pages, album accordion binding. 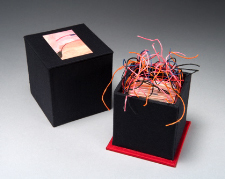 Open the cube to reveal a colorful jumble of linen thread. 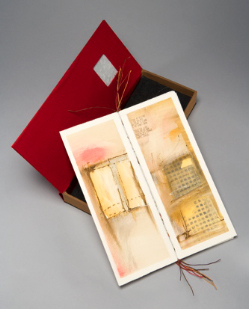 The book, with a tied binding, is made of origami envelopes, each painted and with handwritten text. When you become reacquainted with a friend after several decades--having only remembered their qualities-- their faults may begin to come back into focus during a long conversation. "I am not dignified," says one phrase of the handwritten text. It's a challenge. Will it ever stick? 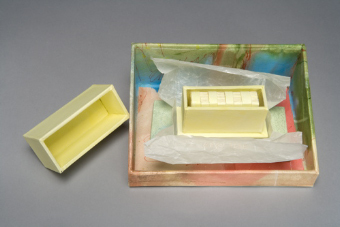 Here is a painted tray of--butter? No, it's a box that opens to reveal--butter? No, a tiny book with a crossed structure binding that looks like it's divided into eight tablespoons of--butter? Well, yes, actually. 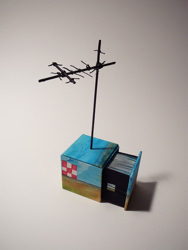 Tiny images float around inside while a story is told as a poem. Is the horizon a line? Where do you draw your boundaries? Why do they keep changing? Who is first on the freeway? The topographic map pages keep turning to ask and answer new questions in poetic fashion. Images are stenciled with white gesso and some areas are varnished for spot shine. 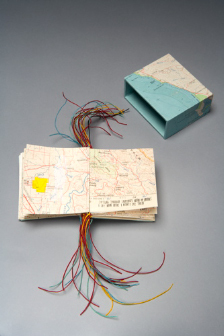 Housed in a slipcase also wrapped in a map, this little book is fun to hold. 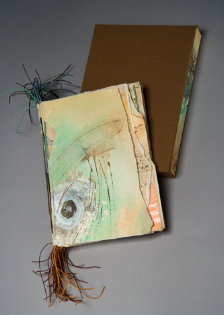 From the outside, the strings hang out of an otherwise sedate-looking brown bookcloth slipcase, but from the inside, the book has painted eyes and mesh holes, concealing and revealing as the pages turn. Handwritten text speaks of certain kinds of hide and seek. Alone or lonely. Waiting in a rented room. A book waiting in the city held together with a tied binding and thick pages. 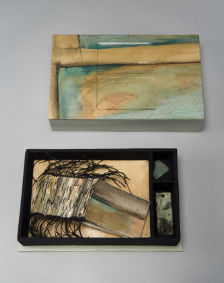 The bookcloth covered box has a glassine window to look in and out of. Painted paper with a crossed structure binding. 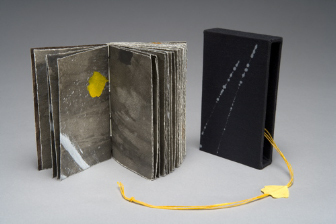 This little black box holds a little black book and the handwritten text examines a friendship that has grown apart. Set of three books with tied binding in a box. Related to printing, reading, and looking: an all-white book is printed without ink (Colorless, not Empty), one book is painted in cyan, yellow and magenta (Process Colors), the third is black, white, and red (Echo Tomorrow, Then Again Re[a]d). These were the first of the tied binding series.